Only my most devoted internet stalkers will be aware of part one of me having a gas leak. And even then, my previous reference was a fleeting posting limited by the 140 character restraint of Twitter microblogging – https://twitter.com/Harry_Scriven/status/588087165126586369. What happened in part one was this. Gloria received a telephone call first thing one morning that there had been a cancellation at the dentist. After I drove her to the dentist, I came home and someone was knocking at our door. He had come to do a gas check and I suspected he didn’t believe me when I said that we had not received a notification. But it was no issue as I let him in anyway. It was all going so, so well and even the gas check guy remarked on how smoothly the checks were going. It did get a little awkward when he found that both smoke alarms had ceased to function. I sort of mumbled about what had happened. Admittedly, my mumbles found me being quite economical with the truth. While I mumbled the truth that that both meters had started going off for no reason I was a little sketchy about the next part. In both cases, the smoke alarms had left the ceiling and had flown rapidly towards the wall. Okay, I gave the smoke alarms some help in their leaving the ceiling and also aided their rushing quickly towards the wall…Anyway, the gas check guy arranged for their replacements. As an aside, the new smoke alarms seem to work as intended. One of the workmen who has been in my house over the last two days set one off yesterday with his flame gun but it stopped as soon as the shut off button was pressed. The shut off button had no effect with either of the smoke alarms that we had at the start of 2015. Back to gas leak, part one. The check went wrong when the meter outside the front of the house was found to be leaking gas. The gas check guy shut off my gas, arranged a date for a new gas check as the leak meant that the house had failed and he called Transco to advise what had happened. And so, I was delayed for work as I waited for the engineer. When the Transco engineer came he replaced a pipe on the meter and all was well. Or was it? Well, today it was part two of “we’ve got a gas leak”. 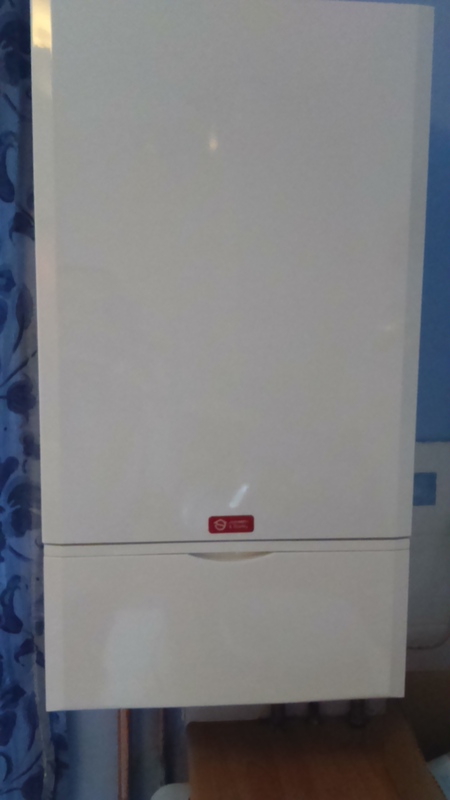 Yesterday and today, two workmen proceeded to replace the ageing boiler and four even older radiators with sleeker and younger models. Yesterday and today also have become my first two days of annual leave from work in 2015. What a way to spend my annual leave, huh! I’ve such a busy social life! Anyway, all was going well today with their final checks until…they checked the gas meter at the front of the house. Yep, there was a gas leak coming from the meter, although the gas was coming out of a different part of the meter this time. I knew the drill – gas shut off and wait for the Transco engineer. A Transco guy came and this time decided to replace the meter. Hmm, a little problem. The spare meter that he had in the van had a part missing. He drove off and over an hour later came back with a shiny new meter. The gas meter spiders seemed a little bemused when their home, the grubby old meter that still measured gas consumption in cubic feet, was lifted onto the grass. I suspect that they’ve found their way back inside the gas meter box by now. I see them each time I read the meter. Years ago when we first met, they were clearly startled by me but now they just watch me read the meter and wait for me to shut the door back again. Yes, I do talk to them but I haven’t given them names like my mother would. I might not have much of a social life but I’m not that desperate for friends that I’ll befriend absolutely anything. That brings me to ask one thing. I keep seeing these adverts on television where people are speaking to their Cortana assistant on their mobile ‘phones. Who is it that wants to own one of these things? Who wants a mobile phone that you then empower to tell you what to do? I can’t think of anything worse. “Cortana, remind me to pick up some milk.” “Cortana, remind me to buy the wife an anniversary gift.” Na-ha! I’m not giving verbal requests to a ‘phone so that later on that day it can tell me what to do. I’d be arguing with it.